Despite its compact size - just 9 miles by 5 miles (14 kms by 8 kms) - Jersey possesses a rich and varied landscape which sends visitors into sensory overload. You might think that an area of 45 square miles (116 square kms), with a permanent population of over 87,000, would have little but buildings to explore. 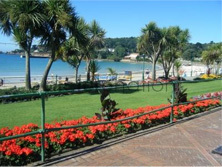 But approach the Island by air and you'll see lush valleys, well-kept fields and an unspoilt coastline. Arrive by sea and the rocky grandeur of La Corbière, the sweep of St Aubin's Bay and picturesque Elizabeth Castle merely hint at Jersey's wealth of history and sheer beauty. The scale of both means it easily rivals much larger and perhaps better-known destinations. Some 450 miles (720 kms) of roadway (a mix of fast routes and quiet rural lanes) create endless opportunities to discover the unexpected and impressive. There's also a 45-mile (72 km) network of narrow country roads known as 'Green Lanes', with a speed limit of 15 mph (24 kph) and priority given to walkers, cyclists and horse riders. But it is the sea that dominates the landscape, with stunning views of the surrounding Atlantic Ocean to be had from virtually every point on the island. The coastline itself is just as compelling, with majestic cliffs, exposed bays, sandy beaches and rocky coves all easily accessible by road or on foot. The power of the sea is keenly felt by the Islanders. In fact, due to its unique position in the Bay of St Malo, Jersey grows and shrinks twice a day as the tide ebbs and flows in excess of 40 feet (12 m) - one of the highest tidal ranges in the world. 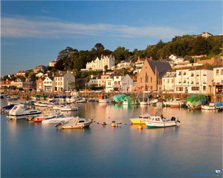 Sitting just fourteen miles from the coast of France, Jersey is the most southerly point of the British Isles, and is a crown dependency, making it part of the United Kingdom but self-governed. Constantly fought over between the English and French for centuries, it has a uniquely Anglo-Norman atmosphere and even has an ancient language known as ‘Jerraise’ – a little used French dialect which is spoken fluently by only a tiny amount of the island’s elder generations. With some of the most stunning beaches and lush countryside in Europe, it’s really unlike any other place in Britain. There are plenty of places to see and things to do.